-Spin for my shawl border (crochet), which additionally requires plying, setting twist. -Toying with the idea of podcasting..
Now, that is just a sampling of my want for today. I still have more!!! Can anyone tell me why and how I will find the time to do all of this today? Anyway, enough ranting. Oh, BTW, add cleaning at least one level of my house. No project pics this week, however, I do have pics of what I use to produce my "artist renderings" of fiber and fabric! You have already met "Lil Gem". As I wrote, I am a half row from binding off my shawl. I will just have the crochet border to complete. That will go really fast! I crochet a lot faster than I knit. Then, the hunt for a quick, mindless toe up sock pattern. Spinning my multicolor dyed corriedale fiber for the crochet border. That's about the extent of my spinning for this week. Listening to Episode 5 of "The Off-Kilter Quilt". I just discovered the podcast and enjoying it very much. Frances has a very calm, pleasant voice. As for my quilting, I will at the minimum get my little quilt sandwiched for quilting. I WILL start my disappearing 9 patch quilt. I hope to make it lap size. Cold weather will be here before you know it. Oh, yeah!!! BTW, this is 3 weeks in a row!!! Jus Sayin'. Yay for me. Just want to say, I am glad it's the weekend. It was a very busy work week for me. Nuf said about work. The weekend is here and it's all about me and what I want to do. Yay! To start my day off, I went to Lowe's, bought mulch, weeded the flower beds, spread the mulch and edged the grass by 8 a.m. Took the dog to the groomer which gave me some uninterrupted time to knit. By the way, none of this took place before I had my morning cup of coffee! Now, about this knitting with handspun yarn....why didn't someone inform me of howe wonderful it was. This is my firt time knitting with handspun yarn and YEAH, it was yarn that I spun myself. How cool is that? Pics of my yarn and shawl in progress.."Lazy Daisy Shawlette" by OrangeFlower. But firt, I have to complete spinning the batts that were processed, drum carded, and dyed with koolaid by me. It was my fist dyeing experience. Sorta messy but I was satisfied with the results. Quilting, what can I say about quilting? Well, I just ordered two (2) BOM's from Stitchin' Heaven" in TX that will start the end of the year. The BOM patterns are Baltimore Christmas and Texas Our Texas '10. Did I mention, I love hand applique? Moving on, I finished a small Basket quilt top since my last post. I hope to get it quilted soon. I have another small quilt that I am going to start. More about that at another time. Until I write again, next week I hope, Bye. Today, my inspiration is brought to you by a lazy rainy Sunday morning. I have been a quilter since the late 80's and had not quilted since I started knitting in February 2009. Recently I was bitten by the quilt bug again after listening to a knitting podcaster who also sews and quilts. Soooo, I went to my messy craft room, dug through my "UFO's, pulled out some unfinished tops, found completed blocks that had not been put together and started sewing. Enough rants for today. I have to now divide my time between three of my favorite creative outlets!!! It's been awhile! Still haven't found a way to commit myself to "blogging" regularly. Between Ravelry, Twitter, work, knit night, life and downloading podcasts, it's been a challenge to say the least. 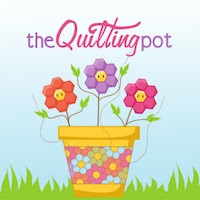 Now, with all of that, I just discovered a "quilting" podcast through a knitting podcast. Guess what, my quilting desire is back. I have been quilting since the late 80's and this was my first love, until I met knitting about a year ago. Now, not only do I enjoy knitting and spinning, I am going to put quilting back in the mix! Crazy you say?? Not so much, just have to learn to manage my time more wisely. If this is not enough, I opened an Etsy shop. The name of the shop is "Just Fiber and Crafts". It's only holding my name and spot. Nothing is in it yet. It will be a "WIP" until I launch it. Hence, the name change of the blog!